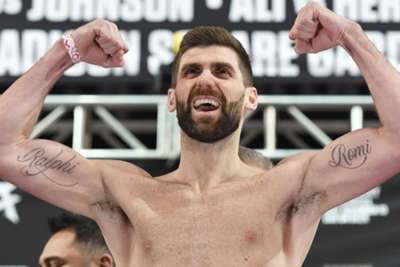 Rocky Fielding will hope to find inspiration from Tony Bellew for his fight with Saul Alvarez after changing trainers helped get his boxing career back on track. The English super-middleweight gets the chance to top the bill at the famous Madison Square Garden in New York when he defends his WBA 'regular' title against superstar Canelo on Saturday. Fielding has worked hard to reach the top, recovering from a first-round knockout loss to domestic rival Callum Smith in November 2015 to become British and Commonwealth champion. The 31-year-old - who stopped Tyron Zeuge at short notice on German soil to claim the WBA belt earlier this year - has also had issues to deal with away from the ring, after his mother, Carol, was diagnosed with cancer. However, once his mother received the all-clear, Fielding took the decision to switch trainers, teaming up with Jamie Moore and Nigel Travis to work alongside fellow fighters Tommy Coyle, Carl Frampton and Martin Murray in the gym. The move paid off, with Fielding revealing how Moore's stable of fighters provided much-needed support before he grabbed the opportunity to take on Zeuge. "I had the defeat, a setback, and a few problems outside the ring with my mum and stuff. When she was on the mend I was just going into fights with no feelings, just 'let's fight'," Fielding told Omnisport. "Obviously, that's where I came unstuck a little bit. I got the wins but once I knew my mum was clear and she was on the mend, I changed camp to Jamie and Nigel and the problems were behind me. "I had a fresh new face in the corner, fresh faces in the gym and I was still working on new things all the time. It's helped me perform in the last couple of fights. "At the start of the year I didn't have a clue where my career was going - no dates, no fights - and then I got a phone call at five weeks' notice to fight for the world title. "The way the gym has been in those six months kept me focused. If I wasn't in the gym when I got that phone call for Germany then I wouldn't have taken it and my opportunity would have gone. "I stayed in the gym and stayed focused and positive. It's presented me to here today." Fielding has received words of encouragement from fellow Liverpudlian Bellew, who came up short in his attempt to become undisputed cruiserweight champion against Oleksandr Usyk last month. "He [Bellew] is an inspiration to me," Fielding said. "From where we started together [at the same gym], his last fight was fighting Usyk – the biggest challenge. "It's the same with me, I don't shy away from any fights. You can ask [promoter] Eddie Hearn, every time he's put a fight to me I've said yes to them all. I haven't knocked anyone back. "Bellew has spoken to me for this fight. We've kept in touch, he's given me some good messages and he's coming out for the fight. "He's an inspiration, for the city and Liverpool fighters."